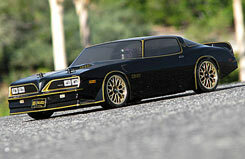 All Products > "107201 HPI Racing 1978 Pontiac Firebird Body (200mm)"
One of the original muscle cars, the Pontiac Firebird had a long and storied history, with its popularity peaking in the late 70's after the release of a certain Hollywood movie featuring the original of this car, the hugely successful black �Bandit' version with gold detail, flared air dams and that famous �shaker' hood! Originally released as a 1967 model and sharing the Chevrolet Camaro chassis, the Pontiac Firebird used various engines from different General Motors divisions to keep its reputation as one of the original �pony cars'. In the 1978 model year, you could choose a base V6 or one of 5 different V8 engines making up to 200 horsepower. To help celebrate the 50th anniversary of Pontiac, the Special Edition was offered to the public in 1976, using black paint with gold accents, add-on lower body panels and more. The popularity of the gold-on-black Special Edition was immeasurably boosted by its starring role in the smash hit movie �Smokey and the Bandit', and the car would forever be known unofficially as the �Bandit' edition! Our replica of this iconic Hollywood motoring legend takes all the familiar shapes and lines and shrinks them down to 1/10th scale to fit on your RC touring car chassis! A huge vinyl pre-cut decal sheet comes with all of the good stuff: official Pontiac & Special Edition logos and even the gold firebird and pin-striping that made the �Bandit' edition one of the most highly coveted cars of the 70's!